In 1987, Cappella Cantorum started the SummerSings Series, informal read-throughs of choral masterworks led by local professional conductors and soloists, now co-sponsored by Con Brio Choral Society. These sessions provide singers with the opportunity to enjoy choral works without the pressure of preparing for performance. They offer, as well, the experience of working with some nationally and internationally acclaimed conductors. In recent years, a wider variety of music genres in addition to the classical choral masterworks have been enthusiastically explored, including folk, gospel, Broadway showtunes and light opera. SummerSings are open to all; Membership in either Cappella Cantorum or Con Brio Choral Society is not required to participate. No advance registration necessary. 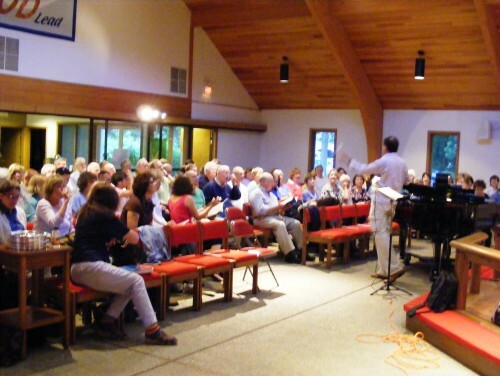 Enjoy casual summertime music making in the air-conditioned comfort of St. Paul Evangelical Lutheran Church in Old Saybrook on several Monday evenings during the months of June through August. A nominal fee is charged for each session. 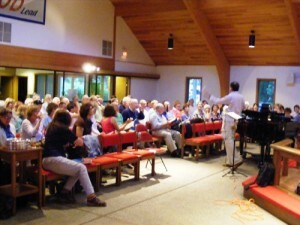 Singers are encouraged to bring their own scores if they have them or scores will be loaned for the evening.